The Department of Veterans Affairs is making available a new medallion to be affixed to an existing privately purchased headstone or marker to signify the deceased's status as a veteran. If requested, the medallion will be furnished in lieu of a traditional Government headstone or marker for veterans that died on or after November 1, 1990, and whose grave is marked with a privately purchased headstone or marker. The medallion is currently available in three sizes, 5 inches, 3 inches, and 1 ½ inches. 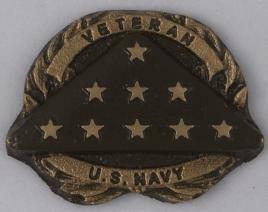 Each medallion will be inscribed with the word VETERAN across the top and the Branch of Service at the bottom. Appropriate affixing adhesive, instructions and hardware will be provided with the medallion. 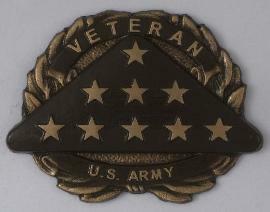 For family members of eligible Veterans interested in submitting a claim for the new medallion, instructions on how to apply for a medallion will be updated on NCA’s web site at www.cem.va.gov/hm_hm.asp. Until a new form specifically for ordering the medallion is available, use PDF VA Form 40-1330; Application for Standard Government Headstone or Marker. Fill the form out completely with the exception of blocks 11 (Type of Headstone or Marker Requested) and 27 (Remarks). Leave block 11 blank. In block 27 put the word Medallion followed by the size requested. For example; use “Medallion 5 inch” to request a 5 inch medallion.